Beautiful cookies are a joy to make and to eat! 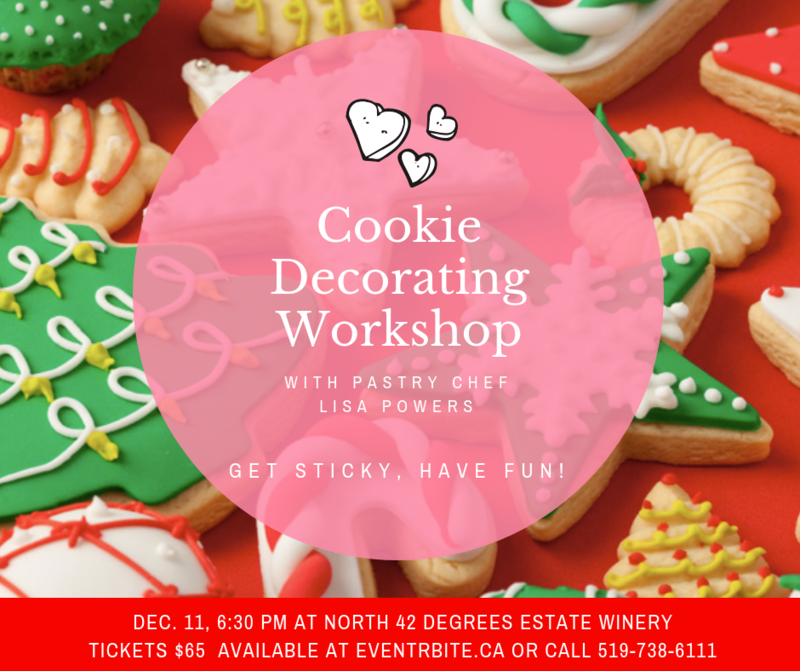 Lisa Powers leads this colourful, fun workshop where you’ll learn how to make, roll and cut perfect sugar cookies. 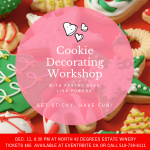 You’ll learn to make the right texture of Royal Icing for specific tasks and decorate with piping tools using Lisa’s professional tips and techniques. All supplies are included. Make an entire evening of the event by booking dinner in our Bistro 42 before the workshop. Reservations can be made by calling us at 519-738-6111. Dinner is not included in the cost of the workshop. Many of us think of sparkling wine only in the case of big celebrations and holidays. 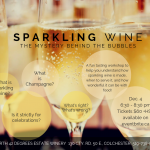 This workshop is designed to uncover the mystery surrounding sparkling wines and how to enjoy those delightful bubbles at any time. 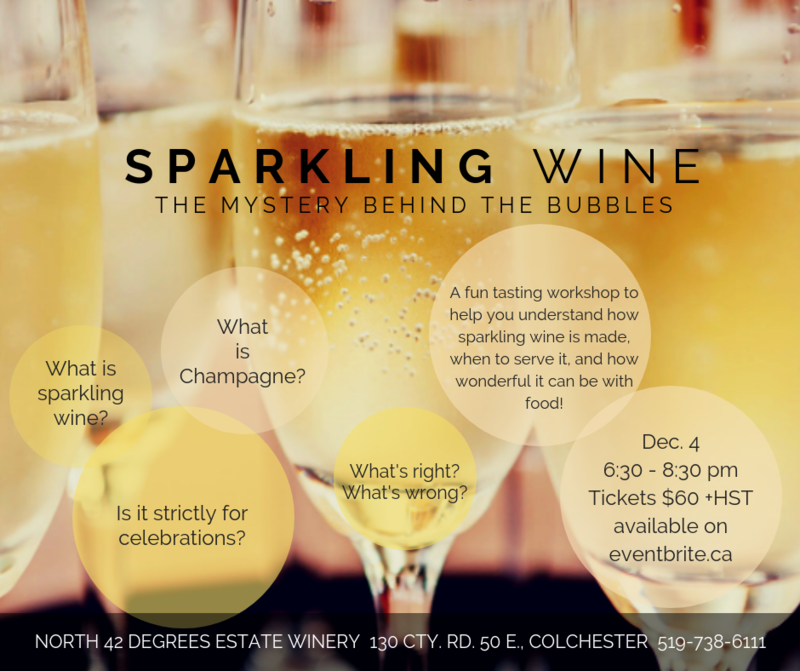 You’ll learn about and taste the difference between Champagne and sparkling wines, as well as how they are made and how they pair with food. 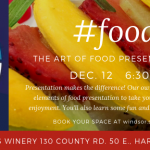 Led by our CAPS Sommelier, Leslie Meloche, this workshop will build your confidence in selecting, pairing and serving this very special beverage at any time of the year. Make a whole evening of this event by reserving a table for dinner at our Bistro 42 prior to the workshop. Call 519-738-6111 for reservations. Presentation, any chef will tell you, is vital to every finished dish. Open your nearest cookbook. Turn on the Food Channel. All the dishes have something in common; beautiful, well-presented dishes. Our Chef Shawn will teach you the art of plating and presentation. He will teach you the rules to food presentation, garnish and techniques to plate the perfect dish and make your table shine. You will learn exciting new techniques such as: foam, spherification, carving and the use of smoke. What to expect: Heaps of concepts to impress your guests and make any of your dishes look as beautiful as they taste. Learn how to set your table, fold napkins and make the use of height for that “Wow!” factor. Dinner is available prior to the workshop. Reserve a table in our Bistro 42 by calling 519-738-6111. Owners Martin and Suzanne are lovingly sharing their Polish culture and Christmas tradition in this busy workshop. 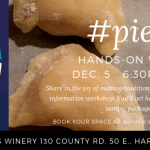 They will demonstrate the technique of pierogi making with step-by-step instruction from the dough to the final dumpling. You will learn how to make 3 different fillings: potato & cheese, Sauerkraut & mushroom, and sour cherry, as well as tricks and tips for making those little packets of love seal properly. Of course, you’ll have a tasting of these delightful creations and take a sample package home. Make an entire evening of the event by booking dinner at our own Bistro 42. Reserve your table by calling 519-738-6111. Learn all about chocolate in our after-work chocolate truffle demonstration. Under the guidance of our owner and microbiologist, Martin Gorski, and our Executive Chef, Steven Straiko, you’ll discover the origins of chocolate, how it is grown, and the process that turns this humble fruit into the chocolate we love. By the end of the demonstration you’ll understand the technique of tempering, preparing a basic ganache and how to hand roll and scoop ganache. 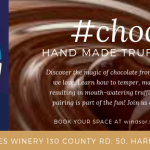 You’ll learn about wine and chocolate pairing with an actual tasting, and each participant will receive a recipe and samples of truffles to take home. Make an entire evening of the event and book your table for dinner at our own Bistro 42. Reservations can be made by calling us at 519-738-6111. 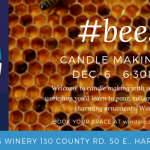 Welcome to candle making with Serenity Lavender Farm, located onsite at North 42 Degrees Estate Winery. Get inspired and create a pure, sweet smelling light from all-natural beeswax gleaned from our own hives. Learn how to make three different types of beautiful beeswax candles, including: a tea light, a rolled beeswax sheet candle and a jarred candle. You will also make two ornaments: a dipped pine cone and molded snowflake, which you will learn to paint. So many good stocking stuffer ideas! We’ve Decked our Halls with Christmas Cheer. Come experience the spirit of the Holiday season at Serenity Lavender! 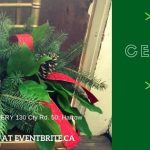 Our Holiday Open House is next weekend so save the date! Come taste our holiday teas and Christmas sweets. 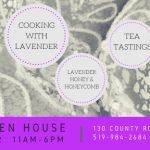 Learn how to cook with lavender and take home some of our favourite recipes, And be sure to check out our new men’s line and other great seasonal products! Hourly draws and lots of holiday cheer! We’d love to see you! In the New Year we teamed up with Anderdon Apiaries with the goal of bringing to you our customers some 100% natural lavender honey. 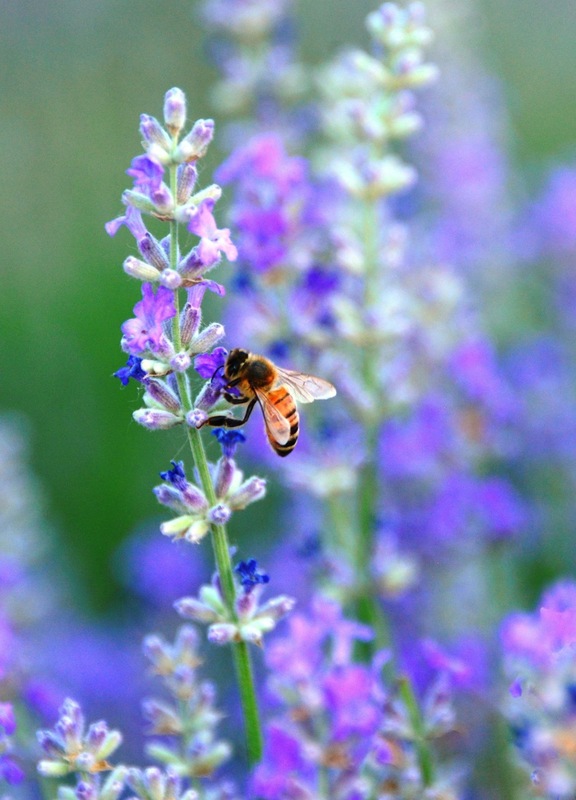 Even though the spring was hard on our lavender plants that first crop of honey had the subtle delicate of lavender. 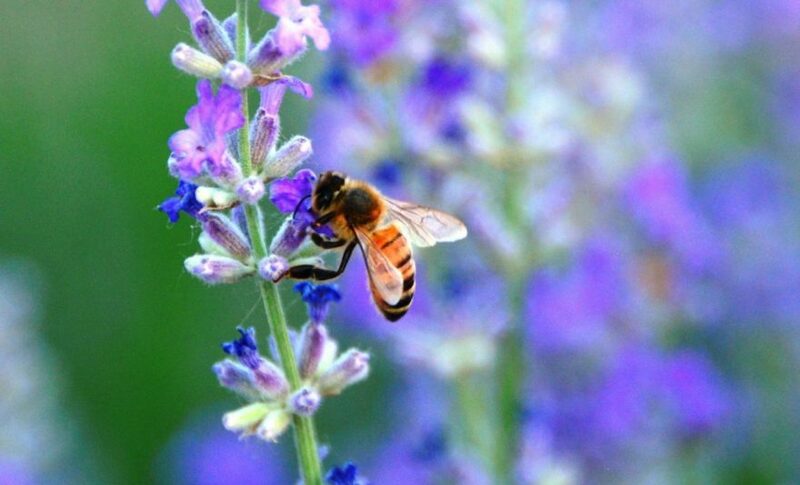 The bees gathered the nectar from those little purple lavender flowers and it transformed the flavour of the honey perfectly. 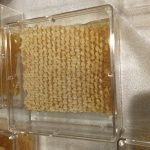 We have been wanting to offer lavender honey for a few years now and did not want to infuse the flavour of lavender into the honey. 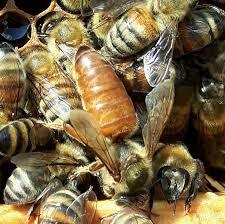 We wanted mother nature’s pure and natural version with the help of our friends, the honey bees. Our patience paid off and despite the damage we sustained to our lavender plants we were able to offer 100% natural unpasturized lavender honey, and boy was it delicious. Once the lavender bloom was finished the bees moved onto to consuming the nectar from all those pretty wildflowers around the farm. This honey was collected, placed in jars and is still available in our retail shop. 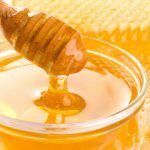 It’s a wonderful product too, for all you honey lovers. 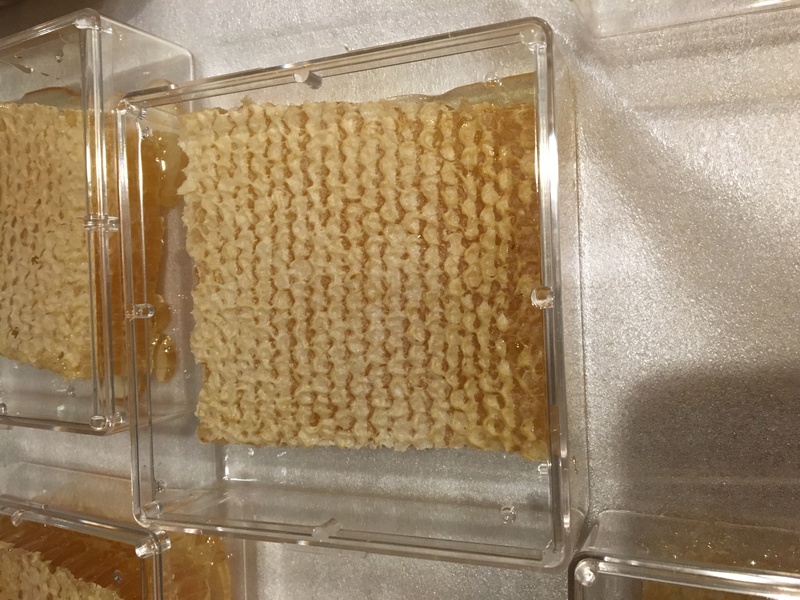 As the season progressed our friends at Anderdon apiaries collected the honey comb and we are thrilled to announce that Honey comb is now in store! 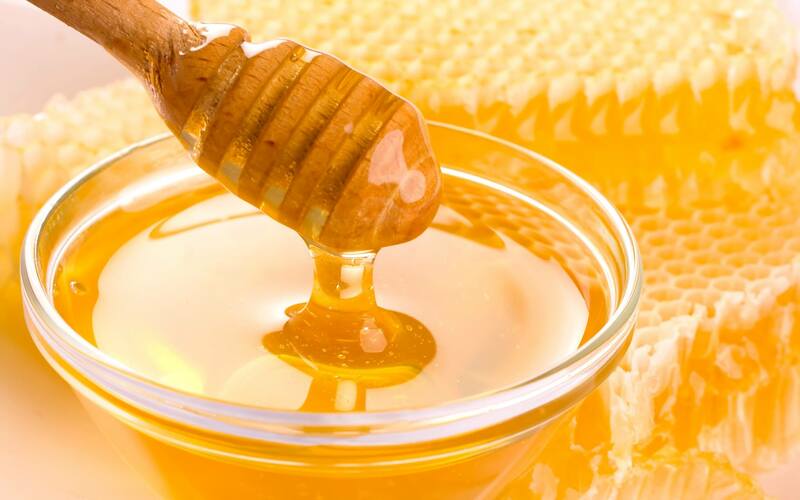 Honey in the comb is pure, simple and its you to places liquid honey can’t. It’s totally safe to eat and people have been doing so for thousands of years. It’s fantastic over a bowl of oatmeal, slathered on a baguette with brie, finely chopped and topped on a salad with finely crumbled goat cheese or on your next charcuterie board. It keeps forever and you can store it at room temperature. Its good for you to. But best of all, it’s made from he nectar of the lavender plants and wildflowers at Serenity Lavender Farm and tastes delicious. You grew and cooked with fresh herbs all summer but now as fall is upon us and what will you to do with all those remaining herbs in the garden. This workshop will teach you techniques to preserve the bounty of your fresh herb garden. You’ll learn some of the creative ways to store and preserve those garden flavourings and which technique is best for your favourites. We’ll share some of our favourite recipes and herb blend creations that you can enjoy for months to come. Participants will receive a notebook and complementary bottle of culinary lavender.